A San Francisco woman has heard about a beautiful old banner owned by a local archive that, rumor has it, was carried at the head of the famous Delano Grape Boycott march led by Cesar Chavez in 1966. The banner features a painted Virgin of Guadalupe and a Union of Farm Workers Eagle, but its original ownership is a mystery. 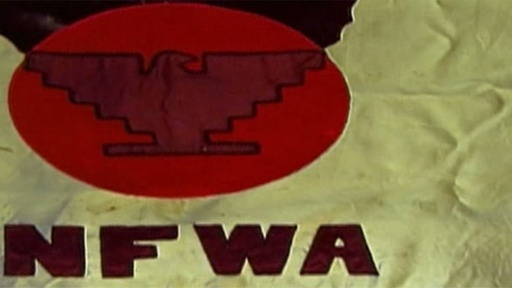 The contributor wants to know what role this banner may have played in Chavez' campaign to pursue better living conditions and rights for Mexican-American farm workers. Also with Gwen Wright China Marine Jacket Can the symbols on this jacket identify a marine who may have witnessed paradise tumbling into disaster? Also with Gwen Wright Chinese Poems Who were the authors of the poems describing bitterness and misery on the Angel Island detention center walls? Also in Season 2 Charlie Parker's Saxophone Could this be jazz legend Charlie "Bird" Parker's saxophone?